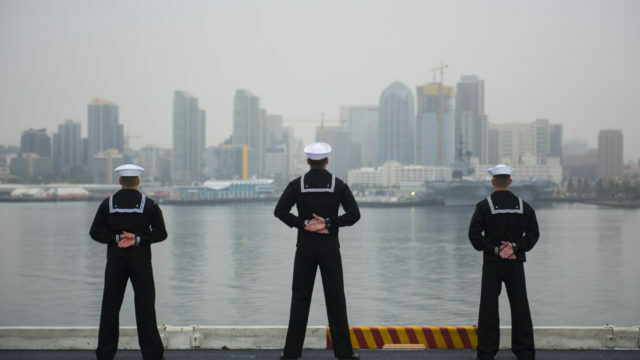 The aircraft carrier Carl Vinson and destroyer Wayne E. Meyer left San Diego Thursday on deployments to the Pacific and Indian oceans. The nuclear-powered Vinson will lead a carrier strike group that will include the Meyer, San Diego-based cruiser Lake Champlain and destroyer Michael Murphy, which will join the flotilla from its home port in Hawaii. The Lake Champlain is scheduled to shove off on Friday. In all, the Carl Vinson Carrier Strike Group will consist of 7,500 sailors and airmen attached to various squadrons under Carrier Air Wing 2. The Navy said the strike group will focus on maritime security operations and theater security cooperation efforts, conducting exercises with partner nations in the western Pacific and Indian oceans. “Our forward presence contributes to freedom of navigation and lawful use of the sea, as well as furthers operational training and enabling the exchange of culture, skills, and tactical knowledge,” said Rear Adm. James W. Kilby, commander of Carrier Strike Group 1,. The Lake Champlain honors a decisive naval battle in the War of 1812. The Wayne E. Mayer is named for an admiral considered to be the father of the Aegis air defense system used by naval vessels.